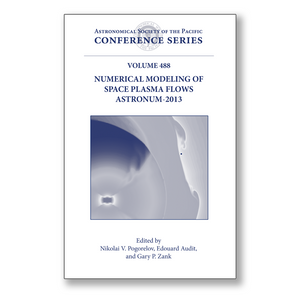 Editor(s): Pogorelov, N. V.; Audit, E.; Zank, G. P.
This Volume contains the Proceedings of ASTRONUM-2013, the eighth in a series of international conferences organized by the Center for Space Plasma and Aeronomic Research at the University of Alabama in Huntsville and Maison de la Simulation, a joint laboratory affiliated with the French Alternative Energies and Atomic Energy Commission (CEA), National Center for Scientific Research (CNRS), French Institute for Research in Computer Science and Automation (INRIA), University of Paris-Sud, and University of Versailles Saint-Quentin-en-Yvelines (UVSQ). The subjects of the conference included such topics as turbulence and cosmic ray transportation, astrophysical and space plasma flows, kinetic and hybrid simulations, numerical methods, algorithms, and frameworks. All of these topics are of great importance to scientists investigating solar structure, the heliosphere, the Sun-Earth connection, and various other astrophysical phenomena. The scientific problems discussed at the conference are characterized by different temporal and spatial scales, regions, or particle populations, for which different sets of defining equations or concepts are necessary to understand the physical systems in their entirety. This book will be of interest to specialists in applied mathematics, astrophysics, space physics, and computer science working on the application of novel numerical algorithms to contemporary problems arising in these fields. It will also be useful to graduate students who want to get acquainted with the fundamental approaches to solving the magnetohydrodynamics and kinetic equations governing space plasma flows.